Tracking of multiple targets is also possible without replicating any part of the system (targets are considered sequentially). Applications of a multiple target tracking system are countless. 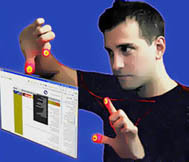 Such a configuration allows, for instance, multiple users to interact on the same virtual space; or a single user to control several virtual tools at the same time, resize windows and control information screens, as imagined in Spielberg's film ``Minority Report'' - but without the need to wear special gloves nor markers. A very interesting characteristic of the proposed 3D laser-based locator, is that it also can be used as an output device: indeed, the laser scanner can be used to write information back to the user, by projecting alphanumeric data onto any available surface, like the palm of the hand. This has been successfully demonstrated, without having to stop the tracking. Finally, hardware simplicity is such that using state-of-the-art Micro-Opto-Electro-Mechanical-System (MOEMS) technology, it should be possible to integrate the whole system on a single chip, making a versatile human-machine input/output interface for use in mobile computing devices. New: check "Sticky Light" and " scoreLight" setups.